ISSN is a worldwide identification code used by publishers, suppliers, libraries, information services, bar coding systems, union catalogues, etc. for citation and retrieval of serials such as Journals, Newspapers, Newsletters, Directories, Yearbooks, Annual Reports & Monograph series, etc. The benefits include international publicity and recognition of the serial by automatic inclusion in the International Serials Directory Database. The International Journal of Advanced Trends in Computer Applications has been assigned the unique online ISSN 2395-3519. Serials are print or non-print publications issued in parts, usually bearing issue numbers and/or dates. A serial is expected to continue indefinitely. Serials include magazines, newspapers, annuals (such as reports, yearbooks, and directories), journals, memoirs, proceedings, transactions of societies, and monographic series. 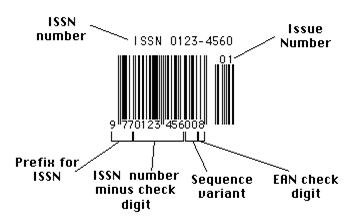 The ISSN is the International Standard Serial Number, which allows the identification of serial publications. It’s a standard numeric code made up of 8 digits whose last digit is a control character that may be the letter “X”. The ISSN distinguishes a particular serial from others. The ISSN also helps library patrons, libraries, and others who handle large numbers of serials to find and identify titles in automated systems more quickly and easily. Does the ISSN Have Any Meaning Embedded in the Number? Unlike the ISBN, which contains country and publisher prefixes, the ISSN contains no inherent meaning.